Just in time for 🎃 Halloween 🎃, our Artist Spotlight features Anna Wilinski, a face paint/body paint artist and co-owner of Jest Paint. Anna was kind enough to take time during the busiest part of her work season to talk to us about her career and experiences. I have been painting faces since I was 10 years old. I started face painting as a part of a clown troop that my mom and another mom started at my school. I paid for college by painting at parties. 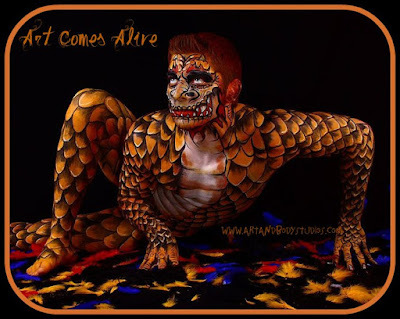 I did my first full bodypainting when I was 26 for an international competition in Florida. What do you enjoy most about face painting? I love the social aspect of face and body painting. I can be creative and I get to make human connections at the same time. It has given me an opportunity to spread happiness to children and adults though beautiful and wild transformations. 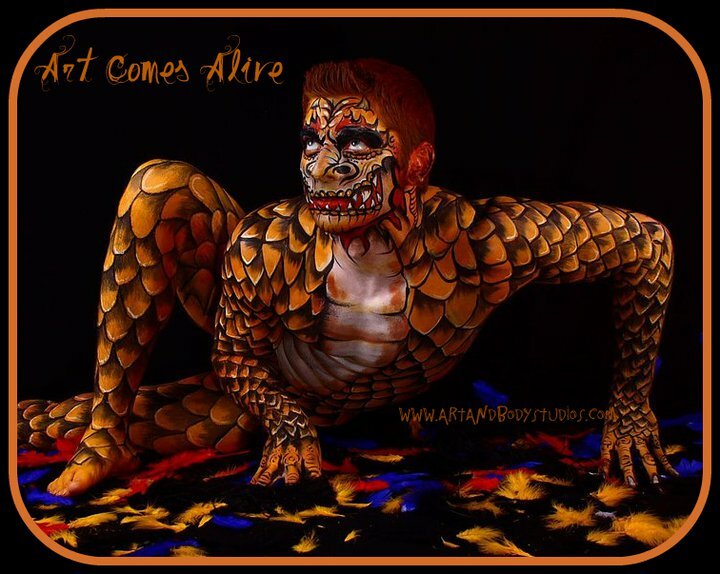 What are some of the challenges of face painting and body painting? Face painting can be challenging when you have to try something new right on the spot. I don’t stick to a design board, so a lot of times kids will ask for things that I never heard of or painted before, and I have to just wing it! Face painting also requires you to work very fast and in all types of weather. Sometimes if feels like your line will never end, and closing the line is definitely the hardest part of the job! 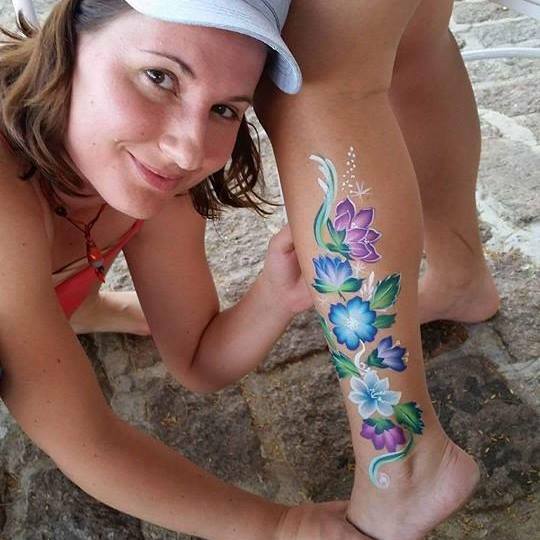 Body painting takes a lot of endurance as well. I usually spend 3-6 hours painting someone, and sometimes you realize that even that isn’t enough time for what you hope to accomplish. It is also hard for the model to stay still for that long. The challenges are nothing compared to the amazing feelings that you get from the positive of feedback from your colorful clients and lasting images that you can take with your camera. Do you have a favorite design or project? I have a few body paintings that I really love. One was a guy my husband and I painted in hundreds of individually shaded scales. It took a long time and a lot of patience, but it was so worth it. He was totally transformed into a wild lizard monster and every move he made freaked me out! I use Global Colours BodyArt water based face paint cakes the most. The colors are really bold and I love the consistency as well. They feel comfortable when on and wash off with soap and water at the end of the day. You just activate them with a wet sponge or brush and they even have cakes with multiple colors which helps speed up your designs and blending. My husband and I help Global come up with new colors and new rainbow cake combinations throughout the year. Their paints are Vegan and Cruelty free and very hypoallergenic. Do you have a favorite Dynasty brush? What do you like about it? I have been having a ton of fun painting with the Black Gold brushes that come with crazy shaped bristles. My favorites are the Butterfly Shader, Whale’s Tail, Hat Trick and the Wave. I can make all sorts of cool flowers, palms, leaves, butterflies, branches, snakes and even sharks with these brushes. I love using them the most when I am painting sugar skulls. I can make so many cool patterns and floral designs with them. 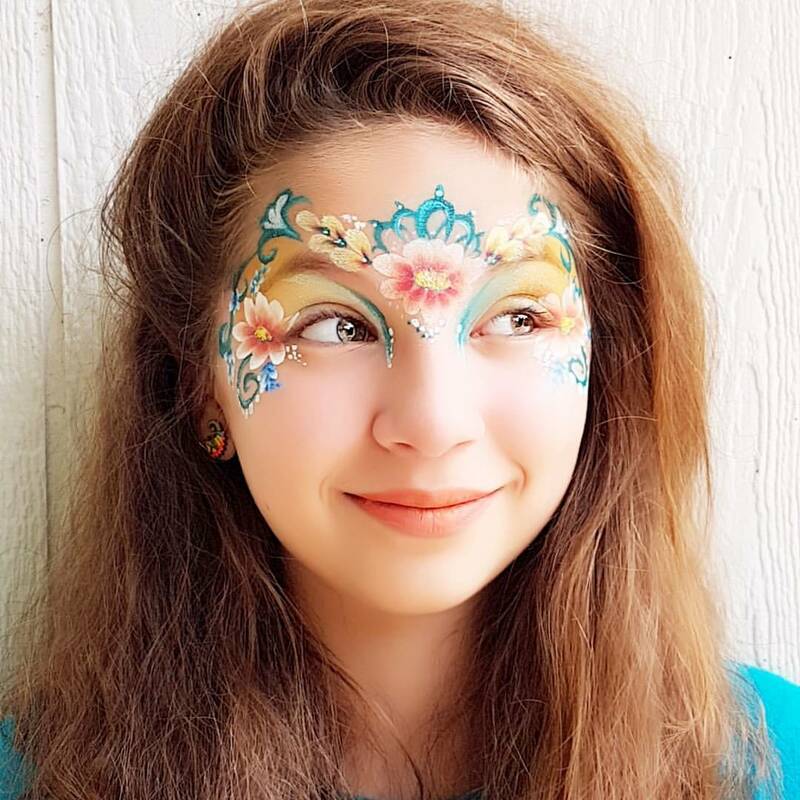 Do you have any advice for those who are interested in trying their hand at face painting or those painters who want to pursue this as a career? If you like being around people, and you like art, then face painting might be a really fun hobby or career. Make sure to buy professional supplies and get entertainers insurance to make sure that you and your customers are protected. YouTube is filled with amazing tutorials. (Click here for Anna's YouTube channel!) I have a couple blogs with a lot of good information for new painters that explain in detail a lot of things to consider when trying to decide how much to charge for your services and the break down of all the products out there. 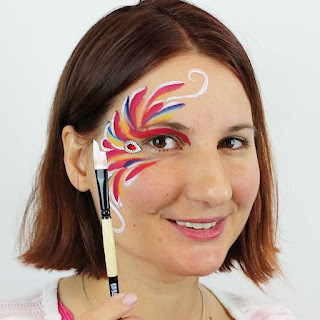 I own a face paint supply store called Jest Paint and we have very active customers that review a lot of our products to help other painters decide what they might like. If you can find painters in your area that get together and have jams, you will learn so much. You can also take classes or head to face painting conventions to get a lot of hands on learning. The best way to learn and see if this is the thing for you is to get a small palette of paint and volunteer your services for a family party or school event. All photos in this blog post appear courtesy of the artist.